It turns out my only “lifer” of the trip was a nonnative member of the starling family, picked up at a McDonald’s like a cheap bag of fries. But I’ll take it. In Florida I’ll take anything with wings. Besides, this wasn’t a birding trip. My visit to Key Largo last month was triggered by a broken leg. Not mine, my dad’s. He needed help, and so did mom, so my brother and I went down to assist. I packed my binoculars but didn’t expect to use them much. Yeah, right. This is Florida—warm, tropical and always birdy. When I go there I’m constantly checking the skies for magnificent frigatebirds and short-tailed hawks, scanning the treetops for white-crowned pigeons, and eyeing the roadside swamps for herons, egrets, anhingas, spoonbills and wood storks. These and other Florida specialties are conspicuous, even from a moving car. Hour for hour, I’ve birded in Florida more than any other state except Illinois. Some of my best birding memories are from Corkscrew Swamp Sanctuary, the Everglades and Dry Tortugas National Park. I keep a list of birds seen in Florida and enjoy the challenge of adding to it. In December my big opportunity was a visit to Loxahatchee National Wildlife Refuge, 12 miles west of Boynton Beach in Palm Beach County. I’d heard good things about it and was eager to spend a whole afternoon outside. Maybe I’d even find a few new species like smooth-billed ani and fulvous whistling duck. These and lots of other avian goodies were certainly possible, and no matter what I was sure to see a lot of birds. Loxahatchee consists of 145,000 acres of vital habitat in the northern Everglades. Only a small portion is open to the public—a series of wetland “impoundments” where water levels are closely regulated by the preserve. Birders walk along the edges of these managed areas, on the dikes, affording an open and slightly elevated view of the surroundings. The panorama is fascinating, with ponds, canals and sawgrass marshes teeming with birdlife. I’d noticed a snail kite perched on a power line just before turning into the preserve from US-441. A good start! There are probably less than 1,000 snail kites remaining in Florida—an endangered species that all birders hope to see and one I’d only chanced upon once before. Loxahatchee has several nesting pairs. The preserve’s visitor center shows a truly excellent film about the Everglades and what’s being done to save what remains of this one-of-a-kind ecosystem. Still, as it played, I couldn’t keep from paging through the refuge bird list that I’d picked up at the information desk. Outside there were amazing birds to be seen and I only had a few hours to find them. What was I doing inside a theater? And why was I the only one? It was time to go. A nice boardwalk trail through a cypress swamp is behind the visitor center. But for birders, the main attraction is the Marsh Trail and other pathways around the impoundments. Within an hour I’d spotted three more species that I’d only seen once before—mottled duck, glossy ibis and limpkin. Those sightings alone, combined with the snail kite, made my day. And because this was Florida, egrets, herons, anhingas, kingfishers and moorhens were everywhere. Turkey vultures were constant companions too, swirling overhead all afternoon along with a few black vultures. A red-shouldered hawk zipped by at close range, an osprey hovered over some potential prey, and off in the distance a brownish heron descended and disappeared in the sawgrass. I saw that bird’s dark wingtips just in time to know it was an American bittern. After three hours of birding that seemed like 30 minutes, it was time to drive back to Key Largo. My Loxahatchee bird list had 40 checks, and two of the species, painted bunting and monk parakeet, were new additions for my all-time Florida list. It was a great afternoon, and I’ll surely replay it this winter when I need a little warmth. I’ll also recall my final “life bird” of 2009, acquired quite unexpectedly at the very end of my trip. It happened when I stopped to gas up the rental car on my way to the Miami airport. I was in a place called Florida City according to my Texaco receipt. Pulling out of the station I noticed some birds up on the power lines. They looked like starlings but one seemed different. So I crossed US-1 and pulled into a McDonald’s parking lot. Working fast, I popped open the trunk and dug out my binoculars and Sibley guide. I refound the bird and knew instantly it was something I’d never seen before. 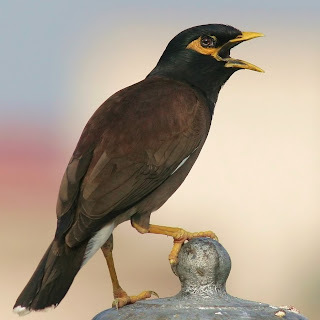 Sibley confirmed it was a common myna, an import from southern Asia. But was this a “countable” bird? Could I add it to my life list? 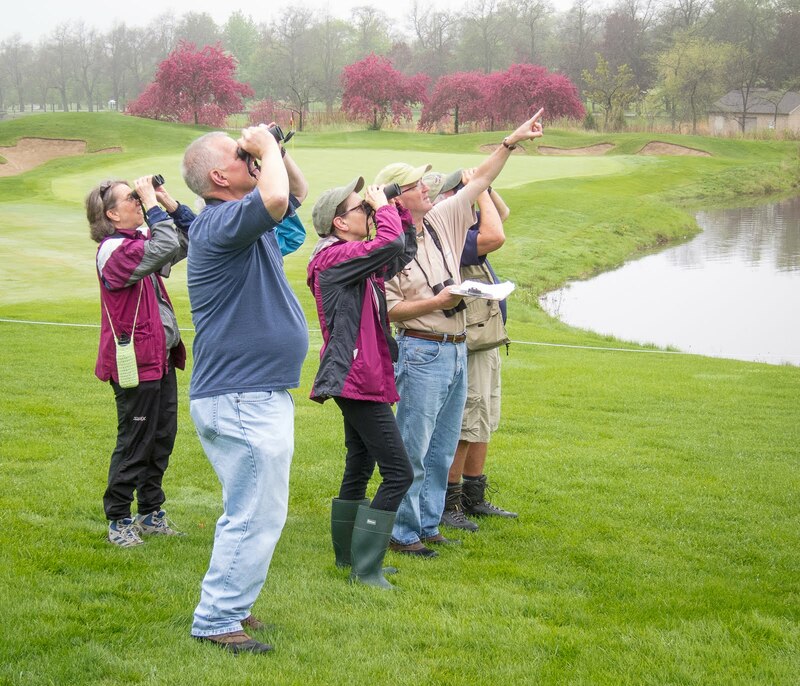 South Florida is home to many exotic (non-native) species and only those with self-sustaining wild populations are recognized by the American Birding Association, our hobby’s rule-making body. I’d need to do some checking. The life bird dance was on hold. Back in Glen Ellyn, a copy of ABA’s December newsletter was waiting in a week’s worth of mail. No kidding, on page 6 was an article titled “Finding Common Myna in southern Florida.” The piece by Bill Pranty—the man who literally wrote the book on Florida birding—had all the information I needed. Yes, common myna was officially countable—it’s among 12 exotic species in Florida now considered “established” in the wild by ABA—and Florida City was mentioned as one of the best places to find one. “Check the parking lots of the restaurants and gas stations,” Pranty advised. At the bottom of the page was a pen and ink drawing of a common myna on the ground, eating a French fry. I’m glad not to have witnessed that particular scenario. As a birder, spotting the bird on a utility wire, mingling with the local starlings, was slightly more palatable. Copyright 2010 by Jeff Reiter. All rights reserved.